The Daily Rant: So Many Delicious Pastabilities! Aunt Jennie is my grandmother's sister, my father's Aunt. 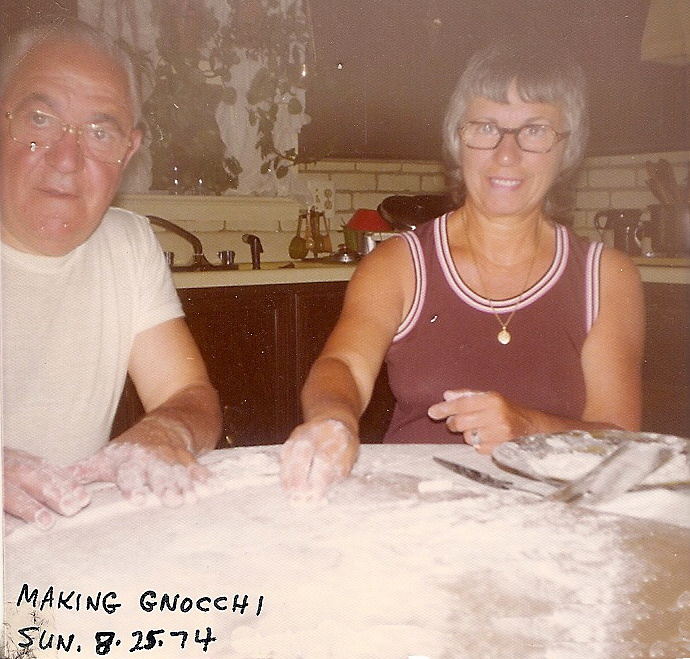 In this photo, Aunt Jennie and her husband, Uncle Lawrence are making gnocchi in our kitchen in New York. I was seven years old. Both Auntie and Uncle were born in Italy and this was one of the traditions they brought with them when they came to America. To this day, gnocchi is my favorite pasta. And nothing beats freshly made. Just watching these women make pasta ignited something in me. I now need to make pasta! And the next time I'm home, I'm going to attempt it. To view the videos in this series, check out Pasta Grannies on YouTube. They also have an Instagram page if you're interested. 2013: I Wonder How These Longhorns Would Feel If They Knew A Steakhouse Was Named After Them? 2006: When I'm Done Peeing, Do I Bang On The Pipes Or Just Yell When I Need Someone To Take Me Back To My Cell?